Ashgate Publishing contacted us last year regarding publishing a compilation of David Kennedy's past papers in a 'Variorum' volume. 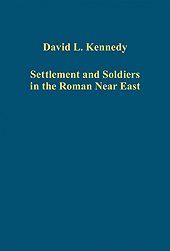 The unifying theme of this collection is Settlement and Soldiers in the Roman Near East, and the final result is a compilation of thirteen papers originally published in different sources from 1980 through to 2006. The volume includes a Preface, Addenda and Index for the included papers, as well as all images from the original papers. The Roman Near East has been a source of fascination and exasperation - an immense area, a rich archaeological heritage as well as documents in several local languages, a region with a great depth of urbanisation and development … yet relatively neglected by modern researchers and difficult to work on and in. Local archaeologists are often under-funded and the Roman period viewed as an earlier phase of western colonialism. Happily, the immense surge in archaeological and historical research on the Roman period everywhere has included the Roman Near East and there have been significant academic developments. This collection of studies on the Roman Near East represents Professor Kennedy’s academic assessment of the region, which began with his doctoral thesis on the contribution of Syria to the Roman army. Although the thesis was never published, several articles owe their genesis to work done then or soon after and are included here (VI, VII, IX, XII). Initial visits to military sites in Syria and Jordan swiftly brought out the presence in many cases of associated civil settlements and - though often now gone, the traces of ancient field systems. Hence, the two prominent sub-themes in this collection are the Roman military and various aspects of society and settlement - settlement types, farming, logistical underpinning and communications.